Hey guys, Kenny Wisdom here again with another strategy article. This time I wanted to focus this weekend’s Portland Regional Championship. Portland is the only remaining Regional Championship in the Pacific Northwest, is one of my favorite places in the world, and is only two hours from my house, so I wouldn’t miss it for the world. I know Portland can be expensive and time consuming to get to depending on where you’re located in the US, but I’d urge everyone reading this to visit the PNW, whether for a tournament or not, at least once. Truly a beautiful place. The tournament is also the Expanded format, which is personally my favorite way to play constructed Pokémon. I know that’s a somewhat controversial statement and I’ll be the first to admit there have been times where Expanded has been a complete mess. Still, I think the fact that the format only grows a little bit with each new set release and that there are a variety of options at all time is really interesting. It’s also beneficial for someone like me to be able to fall back on more or less known strategies and have a clearer direction in testing, since that’s not something I have a whole lot of time to do. Speaking of testing, I knew that between a few personal trips and moving, I wouldn’t have all the time in the world to prepare for this event. However, I also knew I wanted to try as hard as I could, as it being the only Regional in the northwest means I’ll have to be particularly inspired to attend too many more. With all of this in mind, I decided that I would focus on picking a deck I would like to play early on. I figured that if I could lock down a deck a few weeks in advance I would be spending what little testing time I had in the most efficient way. Instead of testing ten decks for one hour each, I could test this deck for ten hours and learn a lot more. It’s still an imperfect system in that you should be preparing optimally for every tournament you care about, but given the constraints I’m happy with my decision. I picked a small handful of decks to play online and discuss with people whose opinions I respect. These decks were Gardevoir (I can’t legally test with Travis Nunlist and not respect Gardevoir), Trevenant, and Drampa-GX/Garbodor. I think Gardevoir is a very powerful deck and many of the people I test and talk with the most have been successful with it over the past few seasons. After talking with some people outside of that circle and playing a few games, I decided to move on. I think Gardevoir is a very strong deck and I wouldn’t be surprised to see anyone succeed with it in Portland, but I decided to go with something I felt was a little more degenerate, as I feel you need to be in Expanded. Speaking of degenerate, Trevenant was next on the list. I love this style of deck and believed in it’s power for a lot of last season, but the Wally banning gave me pause. I put a lot more time into Trevenant than I did Gardevoir, but ultimately decided to shelve it for fear of it being clunky and running into Giratina Promo. Similar to Gardevoir, this deck is strong and I wouldn’t fault anyone for playing it. This left me with Drampa-GX/Garbodor. Thankfully, my good friend and multiple time Worlds competitor Olliver Barr had the same idea about playtesting and the same taste in decks. He immediately sent me his original list, which is only a few cards different than this, which I’m confident I’ll be playing in Portland. Since this list is a bit different than most of the stock lists I’ve seen going around online, let’s go ahead and take a look at some of the card choices. All of the Trubbish options are good, but I think people are massively underrating how powerful Tool Drop can be right now, especially with our high counts of Dimension Valley. This is something that Olliver told me before I had actually played the deck, and I thought he was exaggerating. He wasn’t, and I’m confident giving yourself the maximum number of opportunities to hit with a big Tool Drop is where you want to be. 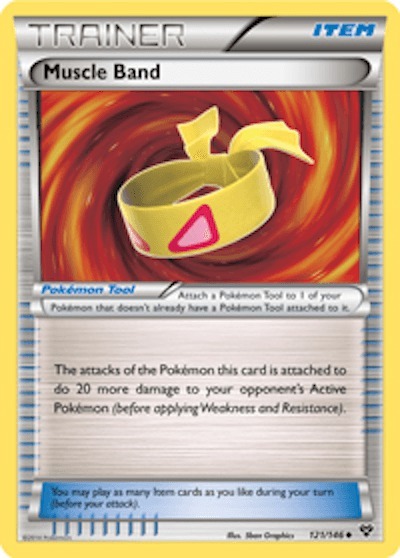 I’ve seen a lot of lists cut down to two of these, which on it’s face makes sense because you have a few other attackers in the deck and can always recur your Garbodor with Super Rod or Rescue Stretcher. In practice, however, I’ve found that you really want to push the single prize game versus a lot of decks. When playing against a primarily EX/GX focused deck, I’ve always wanted to be attacking with a single prize attacker as often as I can. Against Buzzwole FLI and other single prize decks, you want to be making efficient trades where you can. If you’re currently playing two, cut your weakest card for a third and see how much more confident you feel in the average game. For my money, Seismitoad-EX is one of the weaker cards in the deck, but is very powerful in certain match ups and certain situations. So much so that I’m confident you need to be playing it if you’re going to play the Drampa/Garbodor deck in a tournament as large and important as a Regional Championship. The shining example of this is versus the Sableye/Garbodor decks, which I struggled with (and expect to be out in droves in Portland), until leaning heavily into Seismitoad in the match up. One of your best shots at beating Sableye is to set up a board of a Seismitoad-EX with a Double Colorless Energy and Float Stone and a Mew with an Energy. If you accomplish this early enough in the game, you can put your opponent in a position where you’re switching back and forth between each of these attackers and using Quaking Punch every turn, which is very difficult for them to deal with. This situation in particular warrants Seismitoad’s inclusion in the deck in my mind. You can also once again use Mew, this time with a Muscle Band attached, to knock out opposing Trubbish with Quaking Punch. Some amount of time that will literally end the game, and some amount of the time it figuratively will. Lastly, Seimsitoad is amazing at buying time. Whether you have a rough hand early in the game and need to make sure your opponent plays at a similar pace to your own, or you’ve won a long game one and just need to make it so that your opponent can’t quite set up in game two, Seismitoad does the job of chipping away and disrupting your opponent very, very well. I would probably play this card for the Seimsitoad interactions I described alone, and that’s not even it’s primary purpose. Mew, of course, is in the deck to give you game versus the Buzzwole decks. Being a single prize attacker and hitting for weakness, while allowing you to use specific attacks without risking your EX/GXs in the active position makes Mew an auto-include for me. I’ve seen a lot of lists go the route of Mewtwo EVO, which I think is defensible, but much, much worse than Mew. I don’t actually think the Buzzwole decks are very well-positioned for this tournament, and you’re not exactly weak against them even without a dedicated answer, but I would still want to have access to one “silver bullet,” and I think Mew is by far the strongest option available to us. Zoroark is going to be everywhere, and this is your most effective answer to it. I was generally low on Sudowoodo in the past, but the banning of Hex Maniac means that Zoroark is going to have much more trouble dealing with it going forward. It’s not going to autowin the match up or anything, but I think it does enough to earn a spot here. I didn’t change up the Supporter suite too much from the original list Olliver gave me, but I’ve had no serious problems with it. It’s not very far off from a lot of the stock lists out there. I value Colress higher and Acerola a little lower than most others seem to, but that’s about it. I think as long as you’re working with these specific cards, you can tweak the numbers here and there and it probably won’t matter too much. I will say I’ve wanted another N here and there, but we’re tight on room as it is. Mysterious Treasure is a very powerful tool for this deck. It grabs everything but Drampa and Sudowoodo, and does so at the cost of one less card than Ultra Ball. The only downside to Mysterious Treasure is that I feel as though it forces you to have an “extra” (fifth or sixth, depending on who you talk to) way to search out Pokémon, since not having access to Drampa can be important. Still, I think saving a card is going to be more important in the long run, and the deck definitely isn’t hurting for consistency. This just comes down to what you expect the metagame to look like. I expect to play against more of, and would rather have an advantage versus Trubbish, Sableye, Buzzwole FLI and Trevenant, than most other decks in the format. Olliver and I even tried to fit a third Muscle Band in for a little while, but I have more or less settled on two because of space concerns. You still absolutely need access to Choice Band, but I don’t think it’s all that important at the moment. Also, the exact number of Tool cards in the deck is something I’m still toying with. Obviously, you want to fit as many as possible. As I said, I’ve experimented with 8 and there’s no doubt that I feel much more confident with turning on Garbotoxin and Tool Drop with 8 in the deck. I’m just not sure there’s room to be had. If any of you have consistent lists that play 8 or more Tool cards, please don’t hesitate to send them my way. For a lot of people I’ve talked to, this is the strangest thing about this list. The reason I have for including so many copies of Dimension Valley can be found by reading back on all of the other card choices I’ve outlined in this article so far. I find Tool Drop to be an underrated part of the deck. I think Mew tricks are very powerful and, in certain match ups, downright necessary. The way that this deck is built and the way that I go about playing it is very much facilitated by high counts of Dimension Valley. It’s possible that two copies is more reasonable, but I would strongly recommend jamming Dimension Valley into your current lists and seeing how it performs before Regionals. I don’t think you’ll be too disappointed. I really want to fit the fourth Double Colorless and in some ways it is counter to who I am as a human being to only be playing four, but I just don’t think the list can afford it. It would be easy enough to just swap to 4 Psychic and 4 Double Colorless, but one thing I’m very concerned about going into this event is Energy disruption, so I’m not in the business of cutting Basic Energy just yet. If I had to submit my list today I would be playing three Double Colorless, but don’t be surprised if I talk myself out of it last minute. With that out of the way, let’s talk about a few of the cards that are noticeably absent from the list. This is a card that I think you should strongly be considering in most decks. 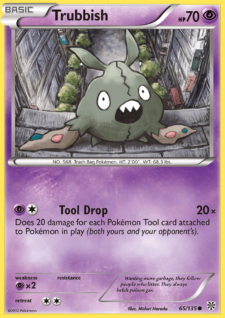 I expect Sableye/Garbodor to be a major player in Portland, and I wouldn’t be surprised if other lock/mill/disruption decks showed up in unusually high numbers as well. The only reason it’s not in the current iteration of the list is because I simply don’t think the deck has room for it. Every time I’ve tried to cut something I’ve come up with a million reasons why that something is necessary to the deck. I’ve talked myself out of it every time, but it’s the decision that I’m most unsure of (It’s the only individual card not on this list that I asked Kyle Sucevich to borrow when I got the physical cards from him), and I wouldn’t be surprised if I end up playing it for Portland. Definitely keep it on your radar, but also understand that it’s not absolutely necessary. Giratina Promo loses some of it’s value for me because I don’t believe that people will be playing Greninja. I think potential Greninja pilots will see that a number of people are playing Giratina because of Trevenant (Giratina is much stronger versus Greninja than Trevenant), and just decide to choose a different deck. I’ve had some issues with the Trevenant match up, but each game has felt winnable (more on that later). 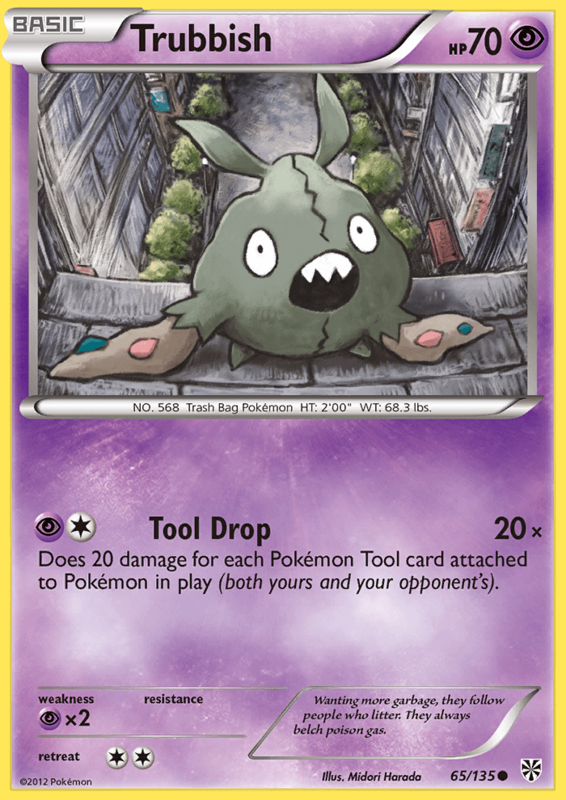 I’m also not even sure how good the card would be in our deck versus Trevenant, as we have a built-in way of getting around it, and are going to have to stick an early tool on a Trubbish either way. These types of decks are always scary to play against and playing Giratina will definitely give you some free wins, but personally I don’t think it’s worth the room. I’ll close with the overarching reason I’ve decided to play Drampa/Garbodor this weekend: I believe it has a chance versus everything. It’s a proven deck in the format, it didn’t lose anything in the bands, and most importantly, I never feel like I’m in an unwinnable situation. The deck has enough going on, between a heavy disruption element in Garbotoxin and Righteous Edge and a very aggressive attack in Trashalanche that I always feel like I’m in the game, so to speak. Once you consider the techs you can slot in and the different angles of attack you can take, you realize you have options for almost every situation you’re put in. As someone who has experience with the format as a whole and was able to dedicate a good amount of time to learning the ins and outs of Olliver’s specific flavor of Drampa/Garbodor, I feel more confident than I have going into a Regional weekend since the last time I played this deck.